Bry-Air’s Gas Phase Filtration Systems and Desiccant Rotors International have participated as a Silver Sponsors in the recently held Green Data center Seminar on ‘Energy Efficiency Guidelines and Best Practices in Indian Data Center’. 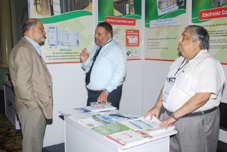 It was held on 28th and 29th April’11 at Hotel Lalit, Bangalore. It has been organized by CII. As per the white paper of ASHRAE (TC) 9.9, Data centers located near process industries, high traffic zones, waste dumping grounds, sewerages/drains, or near any other sources that pollute the environment have harmful environments arising from the ingress of outdoor particulate and/or gaseous contamination. The recent increase in the rate of failures in data centers from such locations emphasizes the need of dust and gaseous contamination control. The most common problems found in these data centers are Copper Creed Corrosion on circuit boards and silver metallization in miniature surface mounted components. As we are moving ahead towards miniaturization of components to improve hardware performance, the components are becoming more prone to attack by gaseous contamination in the data center environment..
Bry-Air EcoScrub Gas Phase Filtration system economically and effectively reduces the gaseous contaminations like SO2, H2S and other corrosive gases to the standards specified by ASHRAE white paper like ANSI/ISA-71.04-1985 severity level G1, from air. Bry-Air’s Gas Phase Filtration systems are are trusted by world leaders for their Data centers, Server rooms and Electronic warehouses like HCL, HP, Blue Star Ltd., IOCL, DELL & Airtel Etc..
DRI, the group company of Pahwa Enterprises, Treated Fresh Air Units provide a complete solution for IAQ and Energy Saving in a single modular unit with option to add modules for cooling, heating, humidification, high efficiency filtration, mixing, sound attenuation, etc. Mr. Rahul Aeron, National Sales Head, Desiccant Rotors International has presented a paper on ‘Electronic Corrosion Control, Dehumidification, and humidity control in Server rooms’. He discussed about Corrosion and explained the types of Contamination.